Today, we are excited to announce our newest project on Kickstarter! 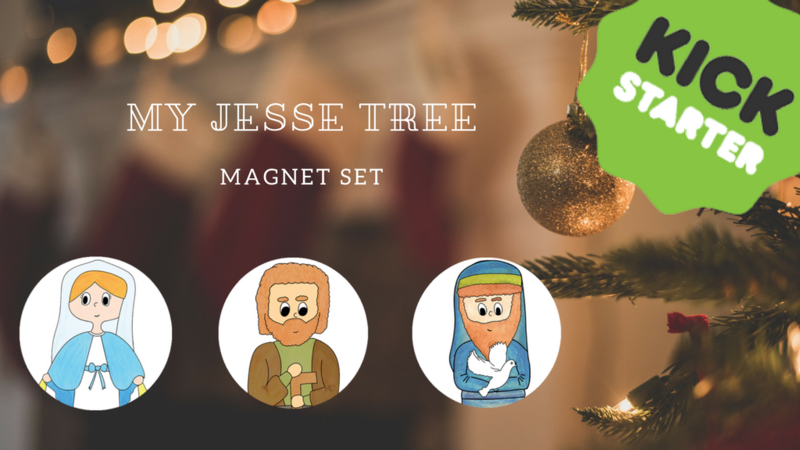 My Jesse Tree: Magnet Set is a fun and easy way for families to learn the Bible stories that bring us to the birth of Jesus. Each day in December, leading up to Christmas, you’ll add a new Bible character to your Jesse Tree magnet board. Every character has its own holy card with a short story. Head on over to our project on Kickstarter to learn more about it and to see how you can reserve your very own set! 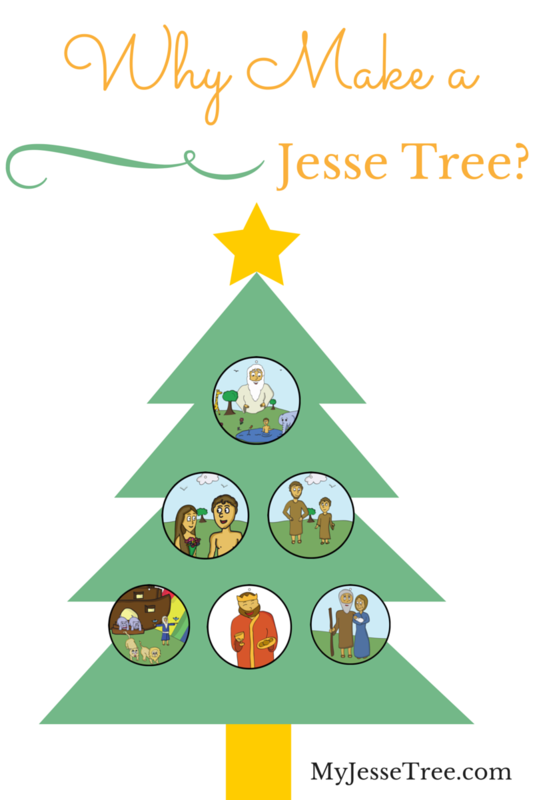 Creating a Jesse Tree is an exciting Advent tradition! But for many of us it is brand new. 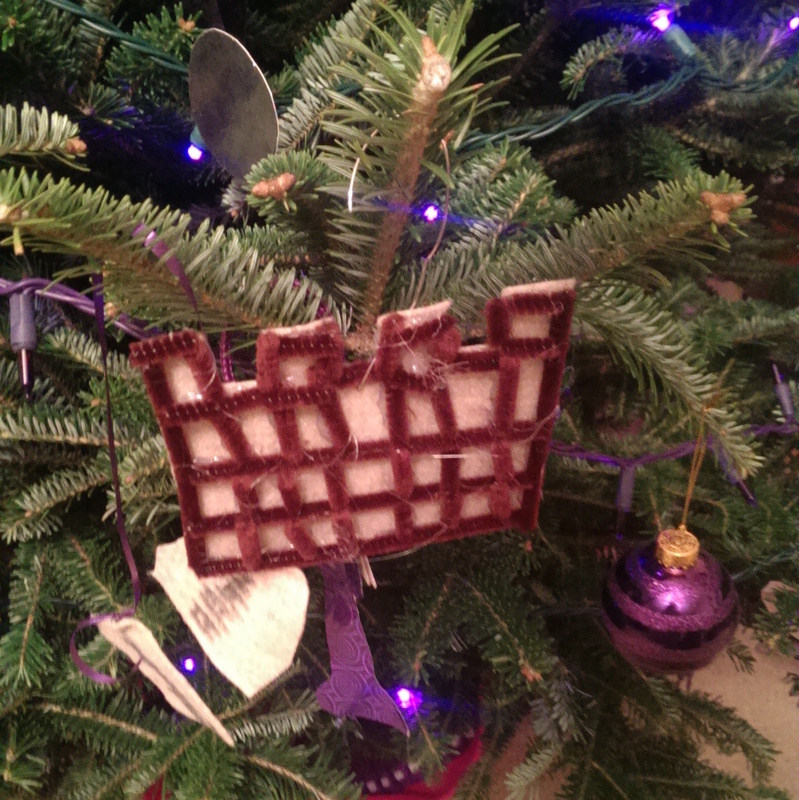 When visiting my sister during Advent, I was inspired by the simple things she did to turn hanging ornaments on the Jesse Tree with her children into a special tradition. You may have your tree, readings, and symbols all figured out, but organizing it all into these simple steps will help to bring everything together successfully. Rather than running to find everyone, start singing to signal to the family that it is time to come to the Jesse Tree. The first lines of “O Come, O Come Emmanuel” work great. 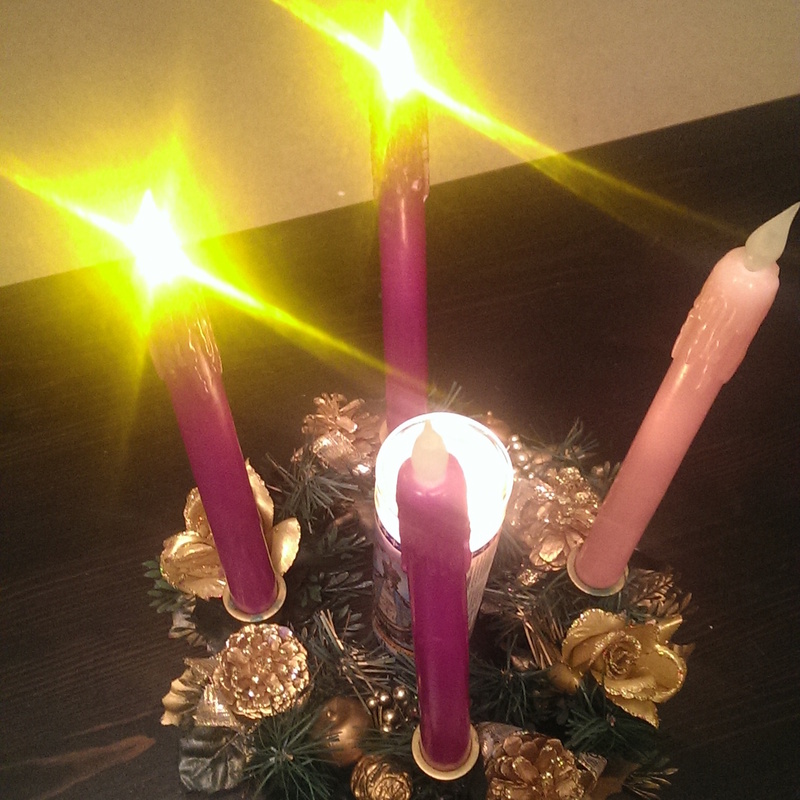 Be sure to light the candles on your advent wreath as part of your Jesse Tree tradition. This will both set the mood and signal to everyone that you are entering a time of prayer and reflection. After singing and lighting the candles, your family will be more ready to pay attention and absorb information. Here, my sister’s family is using the Jesse Tree readings from our book, Bible Characters for Advent. This year they’ll be using our My Jesse Tree Sticker Set. 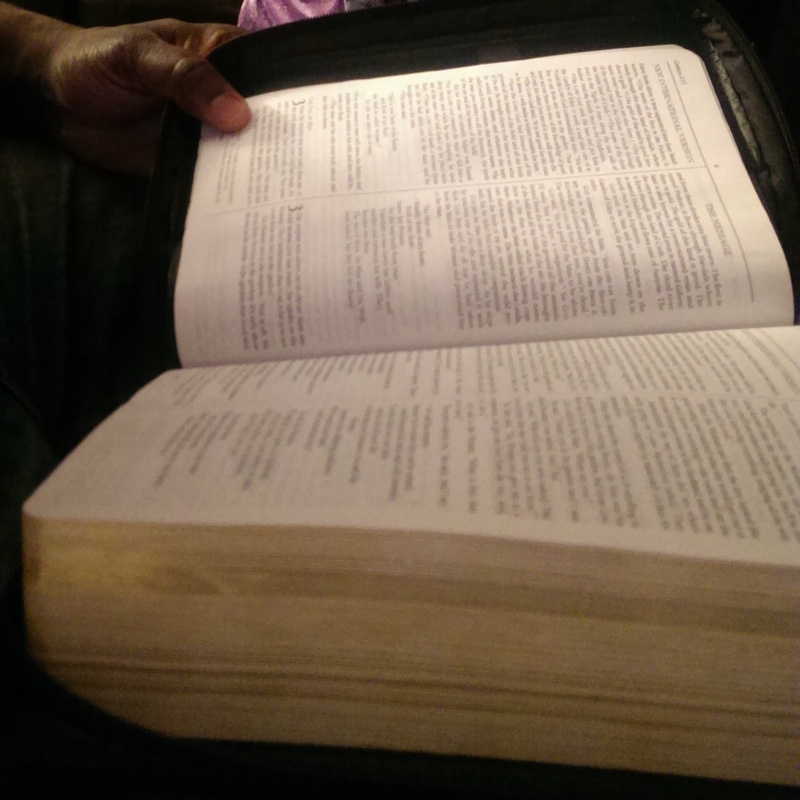 While our readings are written for children, it is also important to familiarize them with the Bible. Each story in our book has a reference to the verse in scripture from which it was taken. My sister’s family started with the story from Bible Characters for Advent and followed that with the corresponding Bible verse. Finally, it’s time to hang your Jesse Tree ornament! Or stick your Jesse Tree ornament on your My Jesse Tree Sticker Set like they will be this year. My sister would alternate which child would hang the ornament each night. While hanging the ornament they would sing “O Come, O Come Emmanuel” which serves as a good “bookend” to the little ceremony. 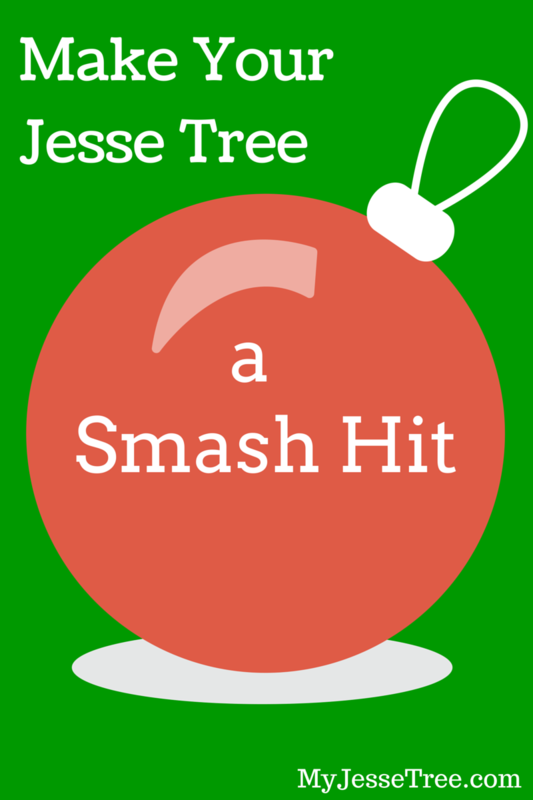 Adding these simple steps your Jesse Tree tradition will help to make it a hit. Plus today is the last day for our Advent Specials! There are two distinct memories I have of my First Communion day. The first is the joy and anticipation as we lined up before Church in our beautiful First Communion dress knowing that at this Mass I was going to receive Jesus into my heart for the very first time. The second memory, was having a friend brag to me later that day that they received more money in gifts than I did. I remember thinking as a little kid… “Well the day isn’t about the money” But thinking back on the moment it reminds me of the importance of giving meaningful religious gifts. 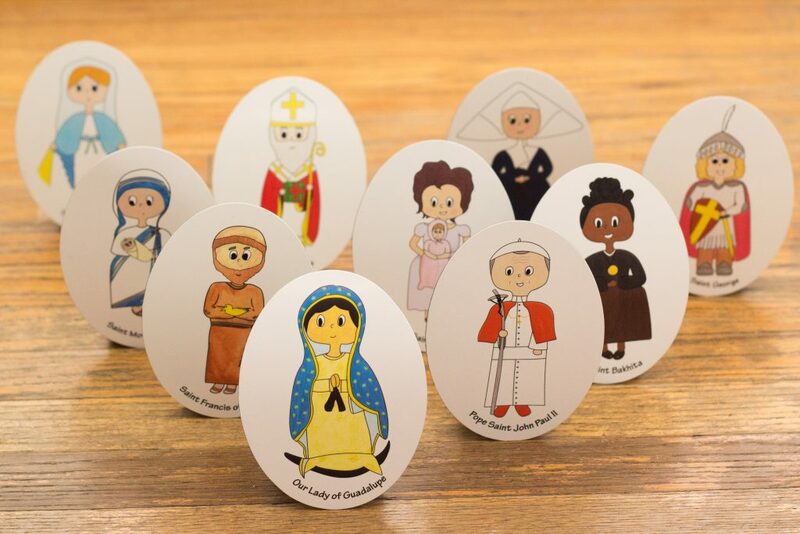 Watching my own children grow and a godparent and I often struggle with the thought… “How do I get a unique gift that has significance, but the child will also enjoy?” My life got much easier after writing Bible Characters for Advent it has been my go to gift for religious events. 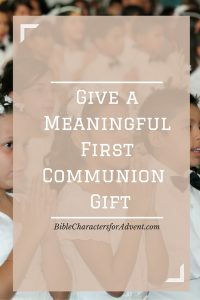 Now it may seem odd to give a gift named Bible Characters for Advent for a First Communion gift. But there is no Holy Eucharist without Christmas. During Advent we walked through all the moments of Salvation History from the moment God created the earth till Jesus birth on Christmas day. But we also looked at all the moments in the Old Testament that told us what to look forward to with the coming of Jesus. Like Jesus giving us his Body and Blood in the Holy Eucharist. Now my son won’t be making his First Communion this year being only 3 years old… But everytime we go up to Holy Communion he tries to make a dive for Jesus crying out, “I want Jesus! When can I have Jesus? ?” Now I want child excited about his First Communion… but my joy is usually masked by the fact that I’m terrified he is going to tackle the priest on his quest to receive Jesus. 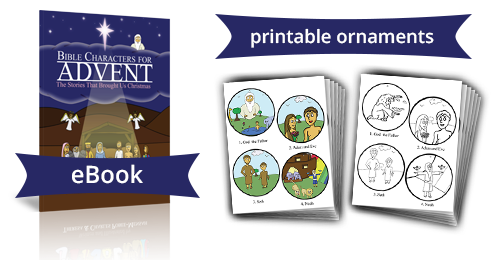 But for the wonderful children who are making their First Communion… Bible Characters for Advent makes a wonderful gift. 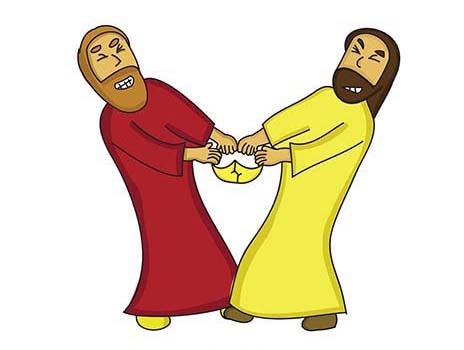 The simple illustrations and short stories are great to recap what was talked about during the Gospel at church, or as a springboard while looking at a particular Bible story. As a parent, godparent, aunt, uncle or friend you have an incredible opportunity to share something when a child you know makes their First Communion. Don’t help them win the cash contest… Give something that reflects the significance of the day. A gift that will help them grow closer to Jesus who they will be receiving for the first time on this very special day. I’ve never compared Halloween to Christmas, but Phil Vischer, the creator of Veggietales was talking about it and got me thinking. 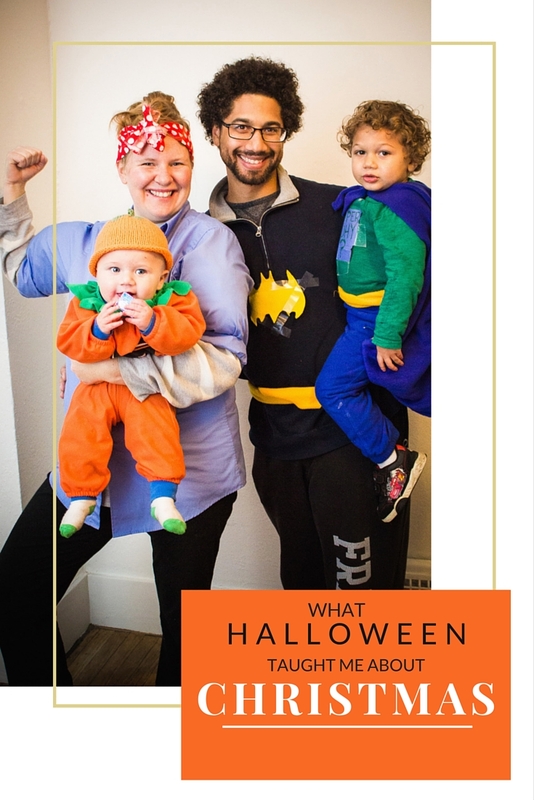 This Halloween went remarkably smooth, we all had great costumes, it wasn’t a nightmare getting ready. It made me think I want our Advent to be this amazing. The secret, we had 3 tries to get it right. #2 Halloween night at church. We were getting better, our costumes had upgrades after several hours of quality time at Hobby Lobby. #3 Halloween night. In the past I was always the person scrambling to finish my costume while everyone else was ready to go. This year was great. I knew all our costumes worked. We had everything laid out in advance ready to go. I want Advent to be like this. If you wait till Thanksgiving to think about Advent it’s too late. Advent has arrived! Obviously it’s great to celebrate Advent no matter when you begin. But Halloween was so much more fun having worked out all the kinks in advance. In the spirit of that I’m getting ready for Advent today! Halloween was way better when we actually prepared. Advent and Christmas here we come. Sure, your Jesse Tree tradition is beautiful. 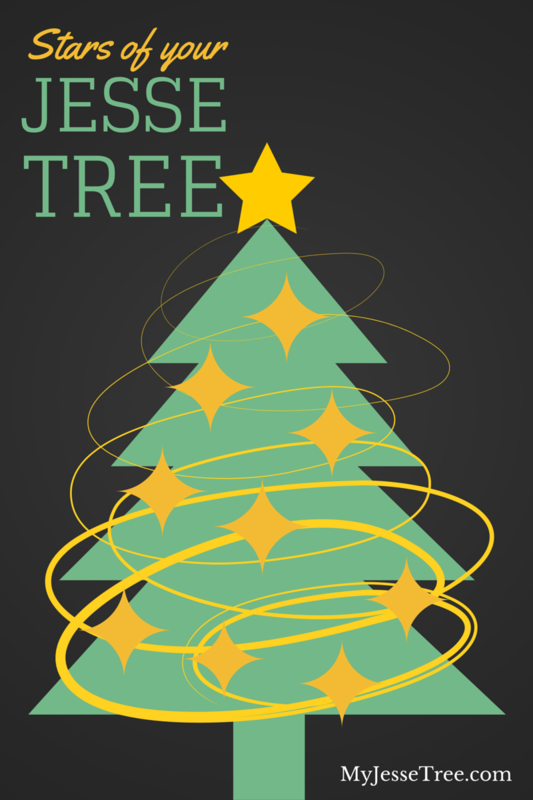 You’ve picked out a tree, found readings you love, and have adorable ornaments. But is it truly a smash hit? I want to leave this Advent season with a few things; a deeper love for Jesus and a great understand and appreciation for the stories in the Bible. But some stories can’t just be told with a book and an adorable printable. I was thinking about the split in the kingdom, when the kingdom of Israel splits into two because the people turned away from God. Once that happened, it could not be fixed. The kingdom was destroyed until Jesus came. Jesus came and preached to the Jews and the Gentiles. Jesus came to bring all people back to God. Kids love when things are visual and interactive. For example, you can make a crown. You can make it out of clay too, but I’m planning paper mache yes, filled with candy. Once you have your crown, you can make it beautiful by painting or coloring it. Then you’ll explain to the kids how Jesus loved the Kingdom of Israel and it was beautiful. However, every time the people sinned and turned against God, they broke their covenant with Him and destroyed the Kingdom God had given them. Now is the fun part where you let the kids smash the crown you’ve made. If it’s a pinata, there’ll be some scrabbling for candy too. Once the crown is broken, have the kids try to put the crown back together. It will be impossible! After the Kingdom of Israel split, the only one who could bring it back together was Jesus. This would be a great activity for Day 18 on your Jesse Tree. Your readings are about Jeroboam and Rehoboam, the two kings who split Solomon’s kingdom. Every day of the Jesse Tree can’t be a big party. But choosing a few special activities for certain days really brings home the point in an extra special way. How do you pick which characters go on your Jesse Tree? There are so many important figures in the Bible, how do you possibly narrow it down to 25? There isn’t a simple answer. People have different opinions. Choosing the stars in Bible Characters for Advent was tough. We put a lot of thought, prayer, and research into it. Our goal was to show how every character on the Jesse Tree related back to Jesus. Growing up, I loved reading my children’s Bible. I could tell you all the stories; Moses, David, Jesus. And they were all exciting stories! But I think I missed some of the deeper meanings. I thought David was awesome because he took out Goliath with a slingshot! I was super excited to make a slingshot after that. However the true reason that David is celebrated is that he was a the greatest King in the Old Testament. He ruled over God’s people, just as Jesus would rule over God’s people. Jeroboam and Rehoboam, those are two names many of us have never hear. Yet they are reason we hear about the Israelites in the Old Testament and the Jews in the New Testament. The big stories in the Bible showing how everyone relates to Jesus can be complicated! That’s why my husband, who has a Masters in Theology from Franciscan University, figured out all the connections. But I love simple stories, just a few words on a page. So I took all of the complicated stories and made them simple so both a child and I could enjoy them. Check out who we choose as stars of our Jesse Tree. So why make a Jesse Tree? Because Christmas is coming everyone is celebrating! There are sales to celebrate the sales coming on Black Friday. is barely here and “the holiday season” is in full swing. It is hard to sit back and watch the festivities. We want to excited about Christmas, but also careful that we’re not teaching our kids that buying things and Santa are the meaning of Christmas. A Jesse Tree is a great solution! You can set up your tree, Now!Ok, I’d at least wait till after Thanksgiving. But with a Jesse Tree you can begin your celebration right away, but you’re not celebrating Santa. Instead it is all the wonderful people in the Bible that led up to the birth of Jesus. Each day you read a short story from the Bible that bring to life the characters in a way that is simple for kids to understand. Then you’ll add your ornament to your tree. You can pick how much time to spend each day, there are simple options for ornaments like full color printables, or you can spend time talking about the stories while coloring your own ornaments.Finally, if you want some really messy fun you can dive into DIY Jesse Tree ornaments. Whether you read a few stories a day or make this a daily tradition during Advent the point is that your family is actively looking forward to Christmas! 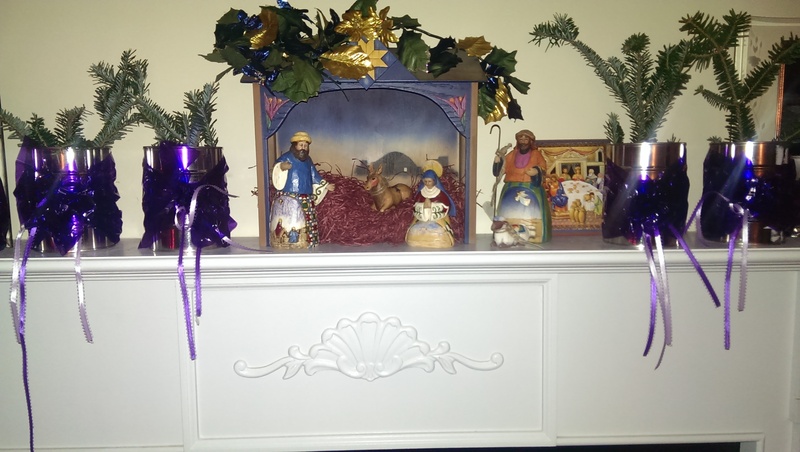 What does your family do during Advent to help keep Christ in Christmas? If you’re looking to start a Jesse Tree be sure to check out The Ultimate Guide to Making a Jesse Tree we’ve compiled all the resources you’ll need. 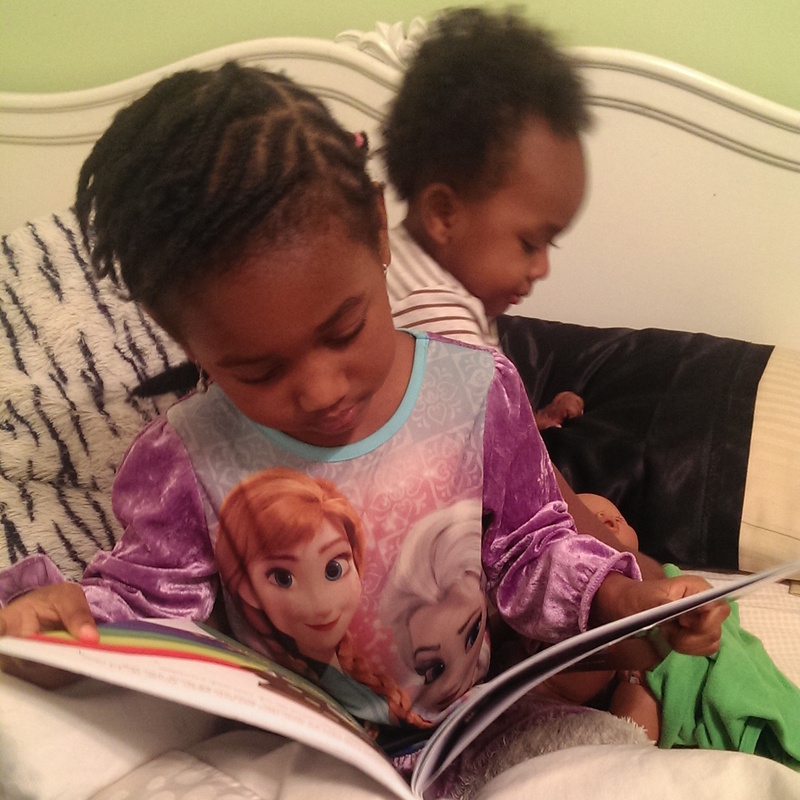 When we read Bible stories to our children, there are common stories that are never forgotten. It it is, after all, very important that they learn that Adam and Eve sinned (it’s the reason for Jesus) or that Moses lead the Israelites in the desert. But in my opinion, the most important Bible story that’s most often left out is the story of Jeroboam and Rehoboam. Rehoboam was the grandson of the great King David. David’s kingdom was the largest and most powerful in all of the Old Testament and when Rehoboam’s time came, he took over as king of that kingdom. But Rehoboam was bent on being a fierce leader, and ignored the council of the older men who advised him to be civil with the people. Instead, he listened to the advice of the people he had grown up with and tried to demonstrate his might as king by showing no mercy and taxing the people heavily. This lead to a war that split kingdom. Jeroboam ruled ten of the twelve tribes of Israel. They became known as Israel. Rehoboam ruled two of the tribes, Judah and Benjamin. They became known as Judah. Over time there would be conflicts and wars with people of other nations and eventually the people of the Kingdom of Israel were defeated and taken away into Exile. While the Kingdom of Judah was also later taken away, they were able to maintain their identity and eventually returned from Exile. When it was all said and done, Judah was all that was left of the original twelve tribes of Israel. And by Jesus’s time, they became known as the Jews. The Kingdom of Israel became dispersed into other groups of people and were lost. When Jesus comes, he doesn’t simply preach to the Jews (the Kingdom of Judah), he also preaches to the non-jews, the Gentiles, who have the Kingdom of Israel mixed in. This fulfills what’s said in the Old Testament. Referring to the Exile, Isaiah says “…the LORD will extend his hand yet a second time to recover the remnant which is left of his people” (Isaiah 11:11). And before that in Genesis, God says to Abraham “all peoples on earth will be blessed through you.” (Genesis 12:3) One way that Jesus makes both of these come true is by inviting all people into the kingdom of God. Growing up, I never really understood why it was the Israelites in the Old Testament and the Jews in the New. And I didn’t get that when Jesus preached to all people it was tied into the stories of the Old Testament. In our Advent book, Bible Characters for Advent, we were sure to include the story of Jeroboam and Rehoboam. But we told it in just 11 sentences and in a way a kid will understand. We believe that if you tell it right, kids really can understand the story of the Bible. Hope you do too.